Place the tomatoes, garlic, onion and water in a blender or food processor. Puree until smooth. Heat the oil in a large soup pot over medium-high heat. When the oil is hot, but not smoking, add the pasta, stirring continuously. As you fry the pasta, it will change in color from a deep white to a deep brown. Take care not to burn it! You want to cook it until it smells toasty, but not bitter like burned toast, about 2 to 3 minutes. Pour the tomato puree over the pasta, sprinkle in the salt, and stir. Be careful, as the puree will want to jump all over your burners, it’s a good idea to cover it partially with a lid. Let the tomato base cook and thicken for about 6 minutes, stirring often, until it becomes a deeper red and has thickened to the consistency of a thick puree. Keep on stirring, so the pasta doesn’t stick to the bottom of the pot. You will see the base of the pot as you stir, but the sauce will not be dried out. Cooking the tomato puree to this point will give the soup a really nice depth of flavor. Pour in the broth, stir, and when it comes to a boil, reduce the heat to medium and simmer for another 10 minutes. Taste for seasoning and serve. My soup came out very bland. I made sure to get the tomato puree to a dark red paste… but I needed to add a lot more salt and pepper and oregano and parsley and basil … and red pepper flakes and tomato paste. I guess this is for children’s palates. I was hoping though the Browning of the pasta and getting the tomato puree to the paste would add the tomato flavor that I’m missing. I also felt as if the chicken broth was a lot and may have overpowered the tomato flavors. Do you think its the broth I used? Thank you Pati for sharing your recipe! I do have a question I hope you will answer. I wanted to know if I could add a diced dried ancho chili to this recipe. If I can, should I add it when I’m sauteing the pasta or when I add the tomatoes? Please let me know. Thanks!! Oh great idea… I would add it when adding the tomatoes. Do you have a recipe for Albondigas? I would love one! I watched an episode last night that had this soup but with different pasta, sandwiches and some cheese cake. I want to find the recipes for all three. Everything looked so good it made me hungry. My son refuses to eat soup, he says it takes a long time to eat… yea he is only 5 so I get his point..I made this soup and now it is his favorite soup ever! or so he says, I know that it is a winner for me so thank you for this recipe and for all your books which have made our lives better! Aww thank you so much Gabriella! And say hi to your son for me. I have a son that has to eat gluten free. Do you think this recipe can be made with gluten free brown rice pasta? I’m hoping it will turn out relatively close to the original! Thanks! P.S. We love your show!! Thank you for allowing us to print your recipes. Will definitely be making alphabet soup. Reminds me of 1 my father made way back in the 60s. Would cilantro be appropriate in this soup? Cilantro would be a great garnish. Enjoy the soup, Bruce. Thank you for tuning in, Alisha and Damo! Will you post the link for the molested again as I must have missed it. Love your recipes! My husband and I and our 3 kids love watching your show. We are making this a second time tonight. My kids love it along with your molettes. We love to see your kids on the show eating and trying new things. Its a great way for kids watching to be enthusiastic about trying them as well! Oh thank you so much Lee Anne! I hope your kids continue to love many more recipes and trying new foods! I love watching your shows with my Daughter. I plan on making this wonderful soup for my three kids. What a Wonderful way to warm up right after school! Thank you so much Pati. It’s a great after school snack! Say hello to your daughters for me! This was an easy variation on my usual tomato-based alphabet soup. I added some soup veggies and a BIG spoonful of chipotle adobo sauce. Delicious! Thanks Pati!! Made today, delish. Could not find my blender base so I used 1 cup of puree and grated onion and garlic. I halved the recipe as it was just for 2 people. I’m so glad you enjoyed it, Wendy! This is my new favorite soup! Love your recipes, Pati. Hola Pati!! I’m so happy I caught the episode for the alphabet soup. I just finished preparing it using no sodium veggie broth and it came out super good! I’m always trying to find new food that I can enjoy as well as healthy meals I can cook for my mami. We were going to go out and eat but after my madre tasted the soup she said lets stay home and eat soup! I’m so happy. Thank you for this recipe and for representing Mexico and our people in such a positive light. Viva Pati! Diosdado thank you so much!!! I made this today and it was very good. Very simple too! Love your show and all the recipes. You have a beautiful family. I will try to make the enchiladas next time. Definitely making this with the Grilled Cheese sandwich. My husband is a vegetarian and I just convert the recipes using vegetable broth or stock. He loves a lot of heat so I don’t scrimp on the chipotle or jalapeño. This has become a standard at my home. My hubby who’s not a big tomato soup kinda guy loves it! It never lasts long…we gobble it right up! Thanks for the great recipe!! Super happy you found a new standard Christine! This is delicious! I don’t even LIKE tomato soup, but I can’t get enough of this! ¡Gracias, Pati! I’m so thrilled you like it, Kristen! Thank you for trying the recipe! I watched the show for the first time love the recipes simple and not expensive due to very little budget thank you. Hola Pati! Yo soy del Df y ya casi se me olvidaron algunas recetas de mi pais como el mole de olla y vi tu show y me gusto mucho y ya lo hice y a mi familia le encanto.A lo igual que el chesse cake con dulce de leche!!!!!Riiico!!!Gracias. So thrilled to hear this, Bridget! I hope your kids are feeling better soon!! My husband ended up LOVING the soup! 🙂 And I wanted to mention that if you have a Trader Joe’s near you, they usually carry alphabet noodles (it’s their own brand). This soup is a big hit with my kids. I make it once a week by request. Yay! So happy they like it!! Big hit with my kids, too. I made this soup for my very picky 2 year old daughter and she loves it. I made it with the fresh tomatoes and the soup has a very light, refreshing taste. I was nervous toasting the pasta, but managed to get to a nice golden brown that adds a nice nutty flavor. A simple recipe that was easy to prepare but packs a ton of flavor. I will definitely be making this frequently in the future! Hola Steve, I’m SO happy to hear your daughter liked this soup! Thank you for trying the recipe!! Pati, you’re darling as is your whole family. I watch a lot of cooking shows but I’m drawn to your show every episode. Each recipe looks wonderful. I want to make the alphabet soup but as I recall on your show, you only used 4 c broth. I thought , that’s perfect for us. Thery’re are only two of us, (seniors, small apetites) so am I wrong about as recipe says 8 C? Please clarify. Thank you. Can’t wait to try the soup, even though it’s so hot here as we live in NM. Continue with your shows, I will look foward to each and every one. Hi Grisha, Thanks for your message! You may make the soup with only 4 cups of broth – just reduce all the other ingredients by half as well. I am making this right now & am questioning the 8 cups of broth? I only used 4 so far, and there is so much liquid after simmering for 10 minutes. I did have to cook the tomato purée & pasta mixture a lot longer than 6 minutes to get to the “thick purée” state, but I made sure to do so. Not sure what I am doing wrong? It does smell wonderful though! Let me know how it turns out in the end! My daughter and I watched your show a few nights ago and I have been thinking about the recipes ever since. I went to the store today and found everything I needed. The soup and molletes were easy to prepare, but the best part was the fact that my super pickey kids ate every bite. Normally they won’t eat anything that resembles a pepper or onion but when they are hidden under a layer of beans and cheese they are all about it. We will definitely make this again soon. I’m so happy your kids liked the molletes! Yay!! Thank you for watching. Thank you for this delicious recipe! I wanted to use up what I had in the cupboards, so for the pasta I substituted Israeli couscous, and for the tomato/garlic/onion I subbed a jar of canned tomato sauce I made last summer! So fresh and delicious and so soothing on a rainy day. Thanks again Pati! Your family is adorable, by the way! Miss.Pati~My Sweet Husband made the Alphabet Soup today & was the Best! The toasting of the Pasta made a huge difference & we will only use this recipe for Tomato Soup from now on because of Flavour,lots of lovely Flavour. Your Sweet Son knows good Foods! Thank you for your message, Pat! I hope you like the soup and the sandwiches, and I hope you try many more recipes too. I have a question regarding the Alphabet Soup. It may be a stupid question, but are the noodles uncooked when you brown them in the stock pan? Hi Jennifer, I’m so excited your daughter wants to try the soup! My boys love it! Let me know what she thinks of it. And thank you for watching!! We made it together last night. She had a huge smile on her face after her first bite and announced it’s now her favorite. Thank You!!!! Today I watched this episode with my husband and son, who is 11. Needless to say, I will be going to the grocery store tomorrow so that we can make all 4 recipes for dinner tomorrow! My son loves to cook and cannot wait to help make the cheesecake. Thank you for a lovely show, and we really enjoyed watching you cook with your sons. You have a beautiful family! (And I like your accent and the way you say “fish”!!! LOL!! Haha! I will tell my boys! So, I have to tell you – my son and I made the soup and the sandwiches! Delicious! They were so good! My son asked two days later if we could make the same dinner again! Thankyou for the recipes. We are fans for life! Hi Pati, we just watched this episode on CreateTV. It was such an entertaining show, and your boys were so sweet. I want to cook this soup for my grand children as soon as I get the right kind of pasta. Thank you for your good recipes and fun show. Hello! I make this soup at least once a week. My family loves it. We add cumin to the recipe and will add chicken pieces for a more hardy dish. But this simple and quick recipe is my favorite! I am going to make it tonight and add chicken pieces as well. I cant wait to try it. I was watching your show on KPBS last Saturday and I ask my 9yr old daughter to join me and let me know if she would like to try the soup you were making. She paid attention to the show and liked the ingredients, so we made the soup together with the “molletes” Loved it!!! Easy, simple and delicious. Can’t wait to cook again with my daughter. I saw you make this on TV last week, and I found the recipe in your cookbook. It looks and sounds so delicious that I am going to make it tomorrow with fideos and home made turkey stock. Thank you for the recipe. Saw your show today for the first time, and these recipes look so delicious and easy. I’m looking forward to trying them! I look forward to you enjoying them! 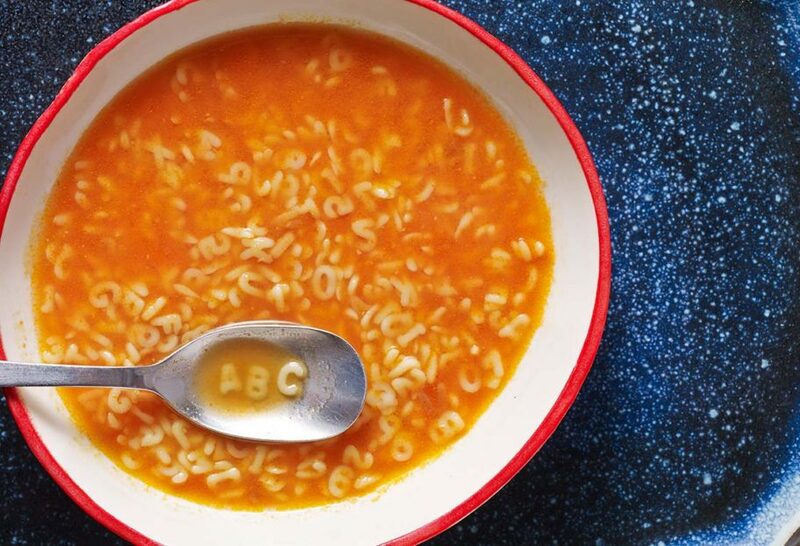 I prepared the Alphabet Soup today,it was delicious! My family enjoyed this soup. It was easy and quick to prepare.